I love micellar waters and I've tried a lot of them. I started the journey with Bioderma Sensibio H2O that I've reviewed back in 2014 and I really enjoyed using it, especially when my skin used to be extremely oily and I didn't feel like using a bi-phase makeup remover or cleansing oil to get rid of my makeup. 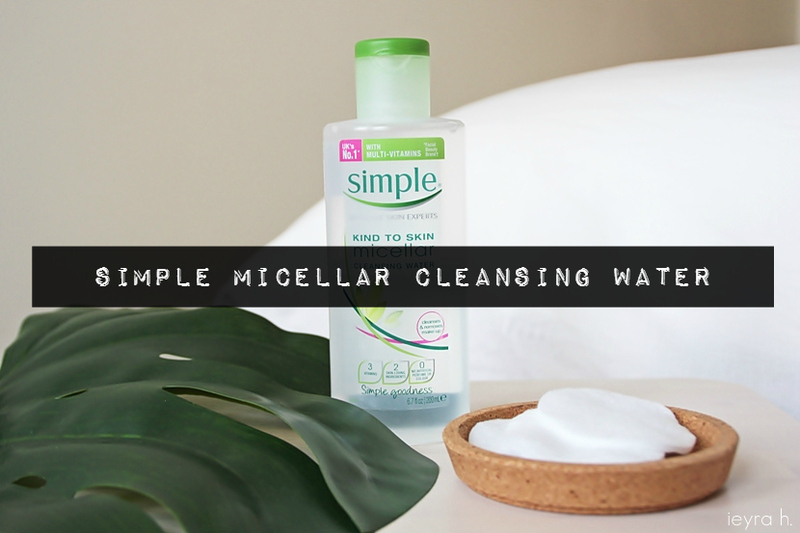 Since then, I started exploring all kind of micellar waters available in the local market including this 'Simple Kind To Skin Micellar Cleansing Water'. 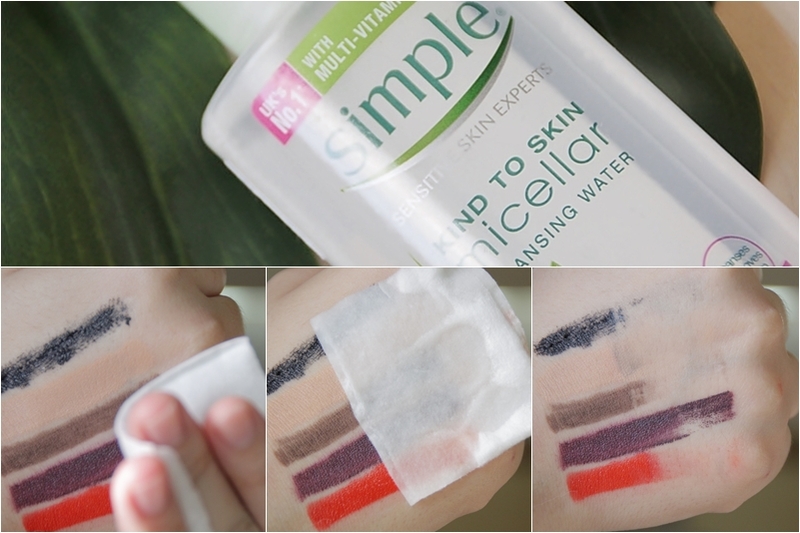 1) Apply a generous amount to a cotton pad. 3) Gently wipe around closed eyes, avoid getting into eyes and no need to rinse after. As instructed, except that I do an additional step which is to rinse off my face with a cleanser. By 'generous amount', I just went with enough to thoroughly dampen almost 80% of the cotton pad. Plastic bottle with a light green cap, eerily similar to the Simple Kind To Eyes Eye Makeup Remover; a product that I loved a long time ago before I discovered micellar waters but didn't have the chance to review it. There are two available packaging for this product, the bottle contains 200ml of liquid and also the other one is in the wipes form. 1. What makes micellar water more than just a water is that it has this thing called as 'surfactant' that create 'micelle', a formation whereby surfactants arrange themselves spherically in aqueous solution (water or aqua, in this case). You guys may be familiar with the word 'surfactant' because it's always related to soaps and detergents! So yes, micellar water is basically a soap water, no jokes! (tak caye cuba shake any bottle of micellar water, mesti ada bubbles!). For this Simple Micellar Water, the main surfactant used in the formulation is Hexylene Glycol. 2. One interesting thing I noticed is that how SIMPLE added Niacinamide and Panthenol to their micellar water. Niacinamide kot!, it's one of my favourite skincare ingredients that has done wonders to my skin. Niacinamide is a well-researched vitamin B3 derivative that purposes several skin benefits such as anti-aging, oil control and improved skin texture. Keep in mind that in order for this ingredient to work efficiently, it is required in a fairly high amount and I doubt the Simple Micellar Water is formulated in such way. In this case, it probably serves not more than just a conditioning agent, like glycerin. Same goes to Panthenol, or pro-vitamin B5 (familiar? well, iklan shampoo kan banyak sebut benda ni lol), it gives the skin feeling moisturised. Panthenol is also a humectant whereby it has the ability to attract moisture. 3. "3 Vitamins" refers to Niacinamide (vitamin B), Panthenol (pro-vitamin B) and Sodium Ascorbyl Phosphate (vitamin C). I think they also referred Niacinamide and Panthenol as "2 Skin Loving Ingredients". I like how this micellar water is formulated with "0 Artificial Perfume or Colour", it's always THE BEST choice for skincare, I mean like why would you want to put fragrance and colourant onto your skin right? bukan ada benefit pun! (huh, basic logic!!). 4. The only alarming ingredient is DMDM Hydantoin, a common preservative used in a formulation containing surfactant which also happened to be known as a formaldehyde releaser and can be a sensitizer to people with sensitive skin. When I first saw this product, I did have a high expectation that it would do wonders for my skin, considering that I have been enjoying a lot of skincare from SIMPLE before this. However, I was pretty disappointed because I didn't like the result I was getting from it - I SIMPLY CANNOT ENTIRELY DEPEND ON IT IN REMOVING MY MAKEUP THOROUGHLY. (1) Foundation/Concealer/Sunscreen- Worked well, it removed every single trace of them nicely and that would usually take 2-3 cotton pads since I have a relatively large face. (2) Lipstick/Lip stain- Practically removed them all but it wasn't strong enough for waterproof lip products and it had a bitter aftermath taste. (3) Eyebrow products- Gave me generally an okay result albeit it was still gentle for pomade. Needed to gosok2 my brows a bit. (4) Eyeshadows/Eyeliner/Mascara- For most of the time, I needed to rub the crap out of my eyes even though the cotton pad was soaked generously with micellar water. I didn't see anything spectacular about it in removing my regular non-waterproof mascara (Maybelline Volum' Rocket Mascara), left alone the waterproof ones... Also, I noticed that I always had this "black rings" under my eyes indicating that my makeup wasn't getting properly removed. Maybelline Volum' Rocket, Bourjois Healthy Mix Concealer, Wet n Wild Eyebrow Pencil, Makeup Revolution Liquid Lipstick and NYX Lip Butter. So yes, sadly, it didn't work as efficient as other micellar waters I've tried before and I kinda feel like I wasted my money, even though the product came from drugstore and priced at RM22.90. Well, maybe, just maybe the hexylene glycol is not strong enough to remove thick makeup. It usually took me 3-4 cotton pads to thoroughly get (almost) all the makeup off. Despite the product was not 100% working, I liked how it left my skin the most comfortable state it could be, there weren't any tightness and dryness I experienced, thanks to several skin moisturising ingredients. It irritated a bit but only when the liquid got into my eyes (Bioderma didn't do this, just saying....). I prefer not to use this product to remove my makeup on daily basis, but I still don't want to toss it yet and I'm not going to waste anything, so I use this for touch-up cleaning together with cotton buds, eg when I get clumsy and the mascara smudges below my eyes. This is probably the worst micellar water I've ever tried. Not impressed. Personal rating: 3/10. There are a lot of better ones out there. (1) In store- You can get this at most stores and pharmacies but I generally pick it up at Watsons.